California Senator Kamala Harris has officially entered the race for president in 2020. “I am running for president of the United States,” she told the world on ABC’s Good Morning America, Monday. “When I look at this moment in time, I know the American people deserve to have someone who is going to fight for them. . . and put them in front of self-interest,” she said on Good Morning America. Her campaign slogan, For the People, is rooted in her experience as a prosecutor. Harris’ announcement on Martin Luther King Jr. Day could be considered an homage to her parents who were both active in the Civil Rights Movement. “Today, the day we celebrate Dr. King, is a very special day for all of us as Americans, and I’m honored to be able to make my announcement on the day that we commemorate him,” she stated with conviction. 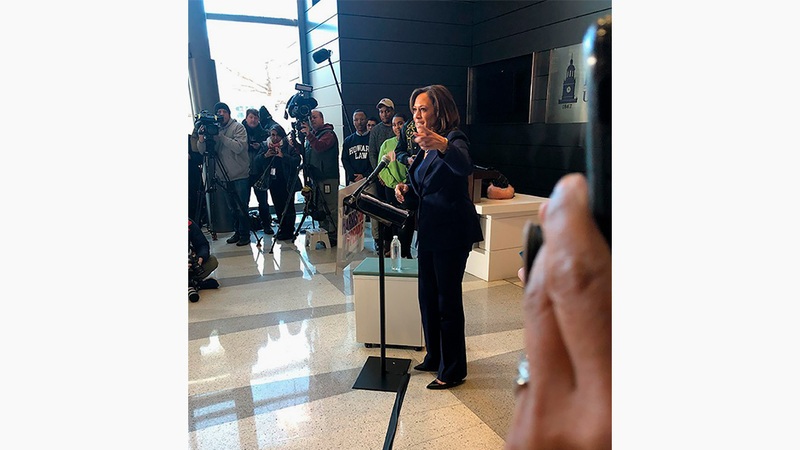 In addition to her announcement on Good Morning America Monday morning, Harris’ day was jam packed. She held a press briefing where she took questions, and later spoke at her alma mater, Howard University in Washington, D.C. where as a student, she first ran for elected office—“This is where it all began,” she told those in attendance. Before serving as the junior Senator from California, Harris was the first woman and first person of color ever elected Attorney General in the state. She is also only the second Black woman ever elected to the U.S. Senate. Harris who grew up in Oakland is the daughter of a Jamaican father and Indian mother (sub-continent of India). She will officially launch her campaign in Oakland on Sunday.